Black Ice Software - BiLPDManager version 2.10 is released! 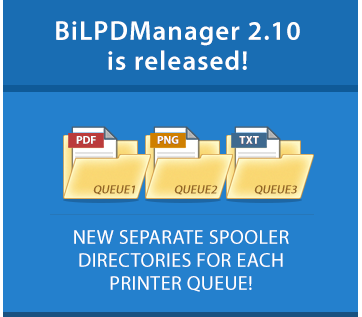 New separate spooler directories for each printer queue! Black Ice Software has released version 2.10 of the BiLPDManager. This version includes new separate spooler directories on the system for each printer queue, to allow administrators to categorize and distinguish print jobs from different printers and systems. The new BiLPDManager includes improvements for naming the printed documents. Also included in the most recent release; the printed output file name is the same as the original file name, allowing users and administrators to track the printed documents. The latest released BiLPDManager version 2.10 includes minor improvements for entering IP Address or Range, and also includes minor improvements on the user interface, to enhance user's experience.